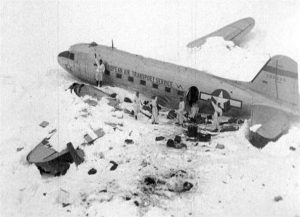 On 19. november 1946 “beached” a Douglas C-53 of the American armed forces on the Gauli in the Bernese Oberland. How miraculously all occupants survived the violent impact, was the machine with a speed of approximately 280 km/h on the road. What followed was a major, multi-day search and rescue operation. 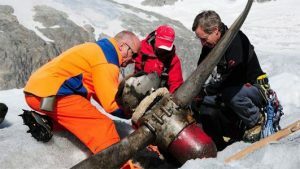 It succeeded Swiss pilots with small airplanes of type FIESELER STORCH to land on the glacier and nine flights to fly the victim in the Valley. This Act is regarded as birth of the alpine air ambulance. 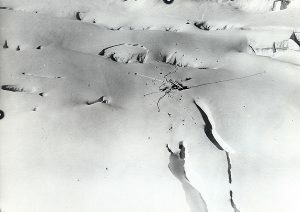 The wreckage of the plane remained for the most part on the glacier, was snowed in and sank gradually into the ice. 66 years later, unexpected on Friday, July 27, 2012, three 18 year old men discovered one of the two Propeller of the C-53- In addition to the propeller, three young people found a Samaritan bag infusion needles, parachute parts and a rug. 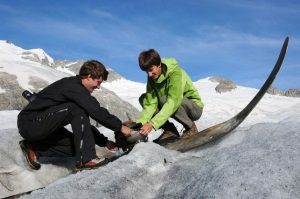 The large propeller was since August 9, 2012 at the Gaulihütte of the Swiss Alpine Club SAC. Using a Super Pumas of the army the mountain detachment of the air force and the archaeological service of the canton of Bern Valdez that historic relic. 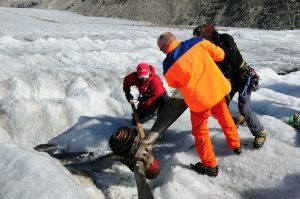 on 26 November 2012, the propeller was flown by the air force for conservation work by the Gaulihütte after Unterbach. This conservation was headed by a restorer of the Foundation of HAM. The definitive location of the propeller was still not decided.